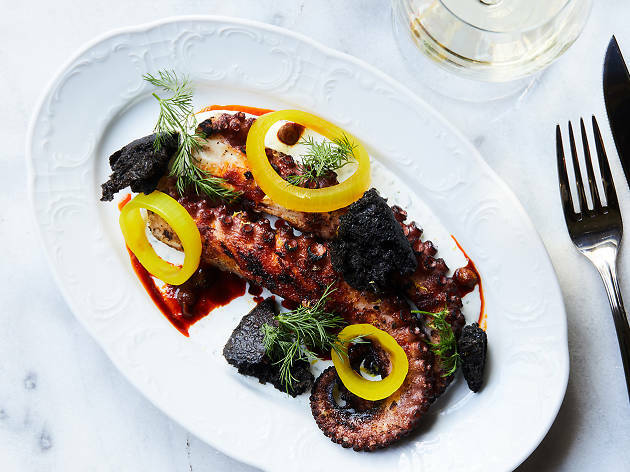 It’s been nearly six years since Bestia opened in the Arts District, and pre-10pm seatings at the rustic-Italian mainstay are still booked out weeks in advance. 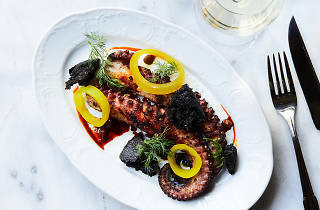 Such is the culinary genius of chef-owners and husband-and-wife team Ori Menashe and Genevieve Gergis, who, amidst the city’s quickdraw rotation of openings and closings, somehow manage to run a restaurant that’s maintained its hype years longer than many can even keep their businesses afloat. And so it is with great anticipation that Bavel opens tomorrow. The duo’s Middle Eastern restaurant draws upon their collective lineages; flavors of Israel, Egypt, Morocco and Turkey are ready to hit tables in their new Arts District restaurant which is, already, booking up those pre-10pm reservations for weeks at a time. The pair hopes you’ll think of it as a communal meal, with your table picking and choosing from a menu of spreads, flatbreads, appetizers, entrées and desserts and sharing in the flavors of this feast not tied to any specific country. Bavel, pronounced buh-vel, stems from the Old Testament story of Babel, when the Middle East was one; as such you’ll find shared flavors, influences and continent-spanning dishes. Of course, this is Menashe we’re talking about—the chef who wisely throws Thai basil and shiitake mushrooms into Italian fare—so don’t expect everything to be strictly traditional; here, foie gras gets blended into halva, and crème fraîche into tahini. Gergis, heading up the desserts, is flexing her pastry-chef muscles with a brief but intriguing rundown of delectables: strawberry sumac and sweet-cheese pastries with pistachio ice cream, labneh cream and cured sumac; rolled paglava (baklava) with walnut and apricot, farm cheese, honey and dried borage flower; and a cardamom apple prune cake with date toffee sauce and cream, to name a few. Bavel will launch Friday serving dinner only, but you can expect lunch service in the not-too-distant future. Bavel is located at 500 Mateo Street and opens on Friday with hours of 5pm to midnight on Friday and Saturday, and 5 to 11pm on Sunday and Tuesday through Thursday.